Time to reflect on the number of dinosaur and prehistoric animal fact sheets Everything Dinosaur has produced. For virtually every named prehistoric animal we sell, our dedicated team members research and write a fact sheet on that animal. From Acrocanthosaurus atokensis through to Yutyrannus huali and probably notes on Zuniceratops, Zalmoxes and Zephyrosaurus too! It is not just new fact sheets that we have to sort out, we also have to re-write and update existing data when new dinosaur discoveries are made. Take for example, the new Coelophysis fact sheet that we have been preparing. We did have a fact sheet for this dinosaur on our files already, but with the introduction of the new for 2017 Wild Safari Prehistoric Life Coelophysis dinosaur model and with new research into the growth rate of this Triassic Theropod, we thought it was time to update it. 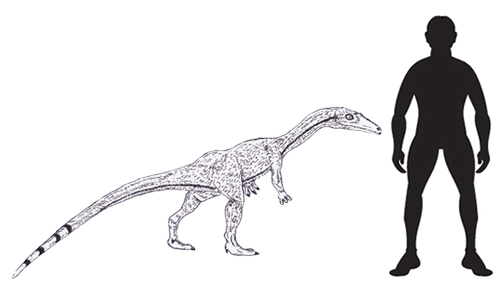 A scale drawing of the Triassic dinosaur Coelophysis. Named over a hundred and twenty-five years ago, Coelophysis (C. bauri) has become one of the most studied Theropod dinosaurs of all. The genus name means “hollow form”, a reference to this dinosaur’s almost hollow limb bones. Light bones would have made this dinosaur surprisingly light and assisted with the animal’s agility and speed. Assets when hunting but also useful when you need to avoid much larger terrestrial predators such as rauisuchids. Everything Dinosaur has recently taken into stock all thirteen of the newly introduced Wild Safari Prehistoric Life models. The additions to our warehouse include the wonderful Coelophysis replica.